fixme: music breaks hack on accurate emulators. Indeed, there are slowings in some levels, but the game is still playable. I guess you just have to put less sprites in those sections and it's OK.
Having played the first one, I must say the second one is no way better than the first. Actually, both kept at the same level. The design is very bad. It's very repetitive, boring overall, some levels are copied from other famous SMB games and some others felt like based on the original SMW. The difficulty curve is a mess: just think that one of the levels in World 6 is a copy of 1-2 from SMB1... yes, a world 6 level. There are lots of difficulty spikes, an example some of the first levels having a pair of Hammer Bros. very hard to avoid. As overall, this hack didn't entertain me. It was actually more frustrating than fun if I have to be honest. I particularly hated the airship levels, since they felt neverending, with slow autoscroll + slowdown due to too many sprites. This is just an example though, there are many and many levels in this hack that felt very boring to go through. Aesthetic-wise, it's pretty much lots of bad paletted graphics from other games with different styles thrown together in this hack like a washing machine. 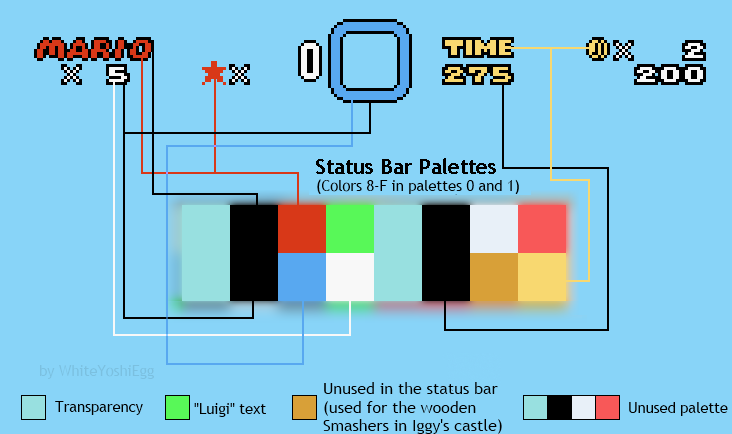 Lots of cutoff, bad palettes, confusing BG/FG, and much more. I'm mainly hurted by the graphics consistency: the author managed to use NES style with many other different styles; they really felt out of palace. Very bad. - Hack breaks on accurate emulator due to music (geez the SMB2 Overworld theme was so bad in that SMAS music .ips huh?). - Sprite tile limits issues. - Major slowdown occuring pretty often. Overall, a very bad hack. It's a bad edit of SMW pretty much, with repetitive design and awful aesthetics.